Liberal fascism sounds like an oxymoron – or a term for conservatives to insult liberals. Actually, it was coined by a socialist writer, none other than the respected and influential left-winger H.G. Wells, who in 1931 called on fellow progressives to become "liberal fascists" and "enlightened Nazis." Really. His words, indeed, fit a much larger pattern of fusing socialism with fascism: Mussolini was a leading socialist figure who, during World War I, turned away from internationalism in favor of Italian nationalism and called the blend Fascism. Likewise, Hitler headed the National Socialist German Workers Party. These facts jar because they contradict the political spectrum that has shaped our worldview since the late 1930s, which places communism at the far Left, followed by socialism, liberalism in the center, conservatism, and then fascism on the far Right. 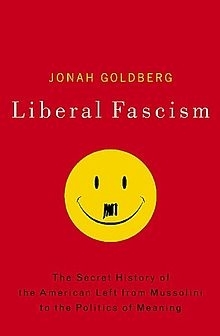 But this spectrum, Jonah Goldberg points out in his brilliant, profound, and original new book, Liberal Fascism: The Secret History of the American Left from Mussolini to the Politics of Meaning (Doubleday), reflects Stalin's use of fascist as an epithet to discredit anyone he wished – Trotsky, Churchill, Russian peasants – and distorts reality. Already in 1946, George Orwell noted that fascism had degenerated to signify "something not desirable." In contrast, conservatism calls for limited government, individualism, democratic debate, and capitalism. Its appeal is liberty and leaving citizens alone. Goldberg's triumph is to establish the kinship between communism, fascism, and liberalism. All derive from the same tradition that goes back to the Jacobins of the French Revolution. His revised political spectrum would focus on the role of the state and go from libertarianism to conservatism to fascism in its many guises – American, Italian, German, Russian, Chinese, Cuban, and so on. 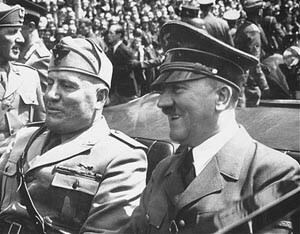 Mussolini and Hitler were both socialists. As this listing suggests, fascism is flexible; different iterations differ in specifics but they share "emotional or instinctual impulses." Mussolini tweaked the socialist agenda to emphasize the state; Lenin made workers the vanguard party; Hitler added race. If the German version was militaristic, the American one (which Goldberg calls liberal fascism) is nearly pacifist. Goldberg quotes historian Richard Pipes on this point: "Bolshevism and Fascism were heresies of socialism." He proves this confluence in two ways. Woodrow Wilson's Progressivism featured a "militaristic, fanatically nationalist, imperialist, racist" program, enabled by the exigencies of World War I.
Franklin D. Roosevelt's "fascist New Deal" built on and extended Wilson's government. Lyndon B. Johnson's Great Society established the modern welfare state, "the ultimate fruition" (so far) of this statist tradition. The youthful New Left revolutionaries of the 1960s brought about "an Americanized updating" of the European Old Right. Hillary Clinton hopes "to insert the state deep into family life," an essential step of the totalitarian project. To sum up a near-century of history, if the American political system traditionally encouraged the pursuit of happiness, "more and more of us want to stop chasing it and have it delivered." Second, Goldberg dissects American liberal programs – racial, economic, environmental, even the "cult of the organic" – and shows their affinities to those of Mussolini and Hitler. If this summary sounds mind-numbingly implausible, read Liberal Fascism in full for its colorful quotes and convincing documentation. The author, hitherto known as a smart, sharp-elbowed polemicist, has proven himself a major political thinker. Beyond offering a radically different way to understand modern politics, in which fascist is no more a slander than socialist, Goldberg's extraordinary book provides conservatives with the tools to reply to their liberal tormentors and eventually go on the offensive. If liberals can eternally raise the specter of Joseph McCarthy, conservatives can counter with that of Benito Mussolini. Jan. 10, 2007 addendum: Two clarifications are in order. All the quotes above are from Goldberg's book. To keep things simple, I do not raise the confusing point that the term "conservative" above refers to classical liberalism. It does not refer to the conservatism of Burke and de Maistre. Related Topics: Conservatives & Liberals, History, US politics | Daniel Pipes receive the latest by email: subscribe to the free mef mailing list This text may be reposted or forwarded so long as it is presented as an integral whole with complete and accurate information provided about its author, date, place of publication, and original URL.